We are an identity that has its origins in the roots of tradition The Latteria Sociale Pieve Rossa, can be proud of its authorization number 150, as it was founded in 1927 in Reggio Emilia by the will of fifty members who wanted to come together in a synergistic way to obtain the best from their forces. From that historical group only seven are still carrying on their cheesemaker work with the same passion. With modern equipment in step with the times in terms of hygiene, but with due attention to create products in line with the ancient conceptions, we work the milk that arrives twice a day and that comes from all members. Delivered in a dedicated area, the operators complete the process before transporting the finished product at the cheese-aging warehouse that guarantees that the Parmigiano is protected in every single step. In the Latteria Sociale Pieve Rossa there is a point of sale, where besides the famous Parmigiano Reggiano DOC proposed in 12 and 30 months aging, also other typical products of these lands are sold. 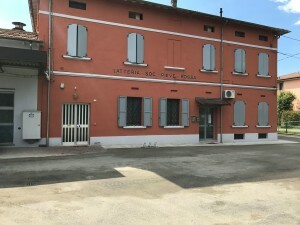 The Latteria Sociale Pieve Rossa manufactures during the year about 8,600 Parmigiano Reggiano units, working something like 46,000 tons of milk from our area. Certified UNI EN ISO 9001 in full respect of the laws in force, our company remains anchored to the concept of some simple farmers who, at the beginning of the last century, decided to take a risk in an experience which is still alive.